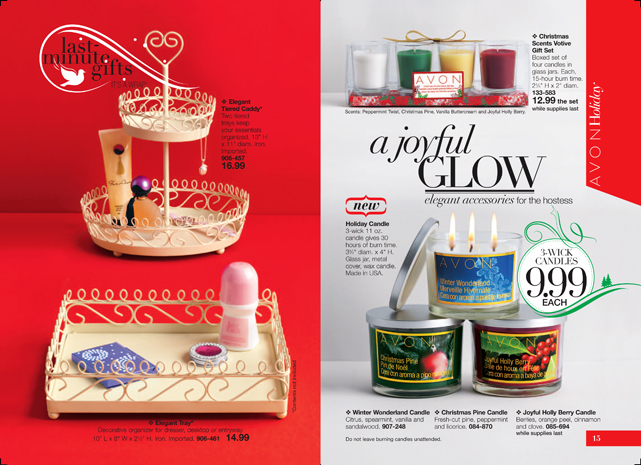 You can still place your Avon Campaign 1, 2014 backorder until Monday, December 16th, 2013. Browse the brochures below, pick the items you wish to order (by item number) and Click Here! to enter your order. The order form will open in a new window so you can refer back to the brochure. You will have to select which campaign the item number is from to get the correct price. Thank you for shopping my Avon website. Place your Avon Campaign 1 2014 backorder until December 16, 2013. Buy Avon Online Campaign 1 Brochure from the comfort of your own home and have it delivered straight to your door. CLICK HERE! to shop my Avon website and buy Avon online. Don’t forget to use Avon Coupon Code PRESALE until midnight November 25th for FREE SHIPPING on any order over $10. Use Avon Coupon Code FS30REP to get FREE SHIPPING on any order over $30 after November 25th. This offer applies to Direct Delivery orders only. Visit my Avon website at shop.avon.com and sign up for our Avon newsletter. Receive special FREE SHIPPING offers and discount specials straight to your Inbox. Oversized quilted tote. Zipper closure. Water-resistant lining with one zip and two slip pockets. 20″ L x 10″ D x 10-1/2″ H; handle drop, 11″. Polyester. Only $19.99 with additional purchase from Avon Brochure 1. Regular Price $29.99. Browse the catalog here or you can get this bag directly online. A 16 1/2″ L pendant necklace with faux pearls and rhinestones and a 3 1/2″ extender. Two pairs of earrings including rhinestone studs and leverback faux pearl drop earrings. Set comes in Goldtone or Silvertone. Only $9.99 each set! Click Here! to buy online through the brochure, or you can go directly to the Pave Swirl 3-Piece Gift Set here. Fill your home with the festive holiday scent of fresh-cut pine mixed with peppermint and licorice. Wax candle in 11 oz. glass jar with brushed metal cover. Each, 3 1/4″H x 3 6/4 diameter. 3 wicks; 30-hour burn time. Made in USA. Never leave burning candle unattended. Keep out of reach of children. Betty Boop Sleep Shirt – Long roomy sleep shirt with glitter accents. Cotton/polyester. Machine wash and dry. Imported. Only $19.99. Betty Boop Slippers – Reg. $16.99, On Sale $14.99. Betty Boop Wine Glass – Only $16.99.Click Here to buy Betty Boop sleep Shirt online now! Warm & fuzzy with a soft sweet sparkle! Slippers have a suede-like upper with faux-fur cuff and soft padded footbed. Polyester. Treaded skid-resistant sole. Imported. Be comfy & cozy in our new Cozy Furry Slipper. Micro-suede upper with faux-shearling cuff, a fleece lining and footbed. Plus a treaded skid-resistant sole. All Avon slippers now $14.99. Click Here to browse Avon’s Plush Slipper Collection online now! If you know a princess-in-training who deserves the royal treatment, then look no further! TV’s most popular princess is now a 28″ H cuddle pillow for little ladies to hug and play with all day. Plush and fabric. Imported. Not for crib use. Now only $24.99 Click Here to purchase Sofia the First Plush Doll online now!